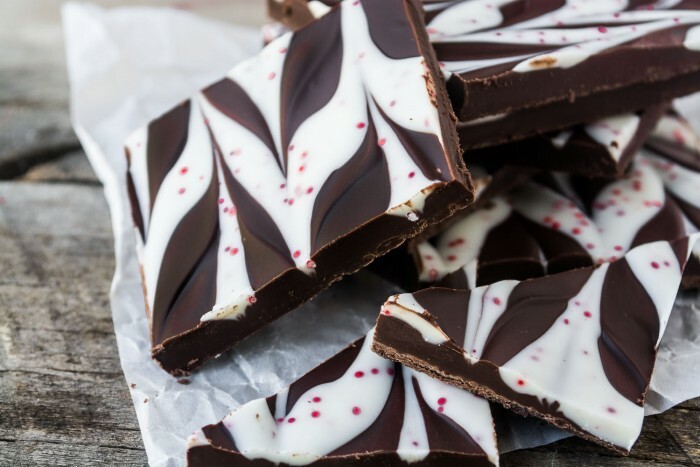 How to make swirled chocolate bark for an easy last minute holiday gift — the combinations are endless and the result is stunning! To make this easy I use chocolate chips whenever possible because they are already in small pieces and they melt quickly. Remember we’re talking about a last minute gift, we don’t want any extra steps. Use good quality ingredients and the flavor will be great. For the peanut butter bark I use dark chocolate chips and peanut butter chips. 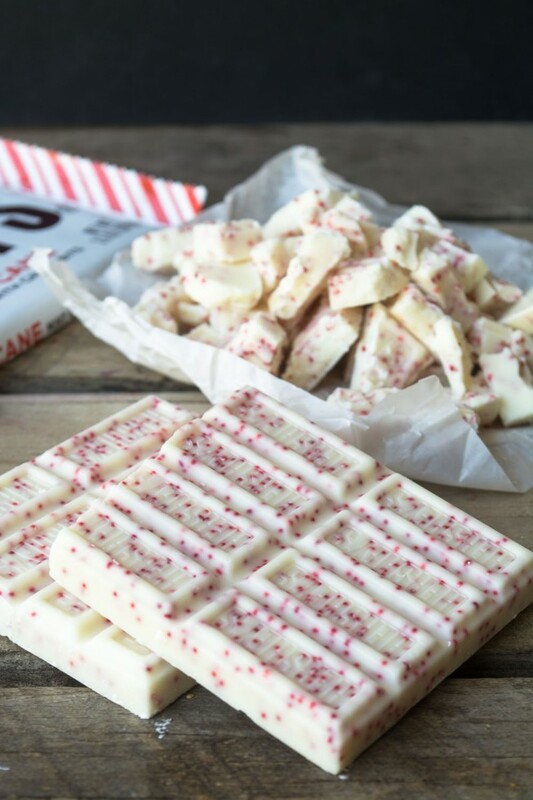 For my Peppermint Bark I used Hershey’s Peppermint Chocolate Bars, the peppermint bits are already mixed in. You will have to chop it up into pieces before melting. 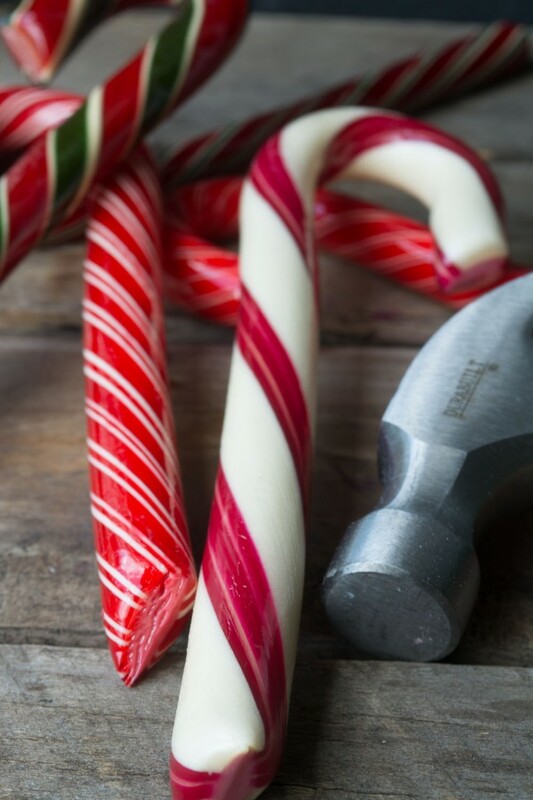 Of course you can also smash candy canes with a hammer to get your finely ground peppermint dust, it’s up to you. The system is simple. 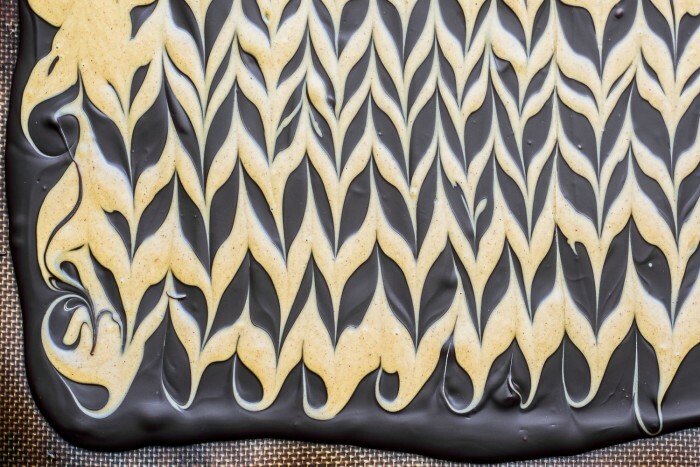 Pour your base layer of melted chocolate on a lined baking sheet and spread out to a rectangle shape. The size is flexible, you can make your bark thin or thicker. Pour the next layer on in stripes, right on top of the first. Then take a skewer and run it back and forth through the stripes, making a swirled, or chevron pattern. You don’t have to do it evenly, you can swirl it any which way you like. Let it harden, I put mine in the fridge, and then you can cut it. You can easily knock out gifts for several friends in about an hour with this easy recipe. One bag of chips forms the base layer, and about 1/4 a bag is needed for the top swirls. Buy several bags and mix and match. 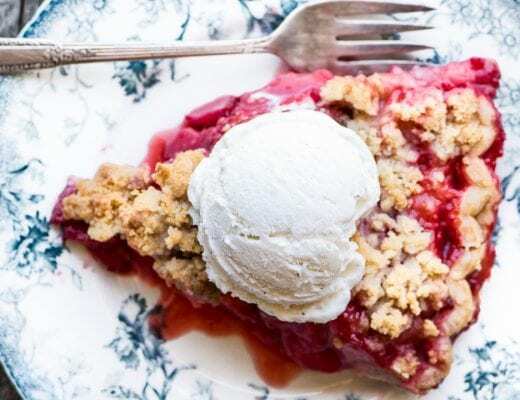 This recipe was inspired by my friend Mary at Barefeet in the Kitchen. 1 Hersey's Candy Cane Bar, cut into pieces. For the Peanut Butter Bark, put the chocolate chips in a small microwave safe bowl. Do the same for the peanut butter chips. Make sure your bowls are clean and dry. Line a baking sheet or tray with parchment paper or a silicone mat. Microwave the chocolate chips for one minute on high. Remove and stir. Microwave the peanut butter chips for 30 seconds on high. Remove and stir. If the chocolate is not completely melted and smooth, put it back in the microwave for 15 second bursts until it is. Do the same for the peanut butter. Pour the chocolate out onto the lined baking sheet. Spread it out into a rectangle shape, approximately 7x10 or 8x11 inches. The size is flexible, don't stress about it. When you've got your rectangle evenly smoothed out, pour the next layer on top, drizzling it in stripes, either the long way, or horizontally. Then take a skewer and drag it through the surface to make swirls. Let the bark harden before cutting into pieces. I like to set my tray right in the refrigerator, but be sure it is level. Store the bark in the refrigerator until ready to eat. For the Peppermint Bark the instructions are the same. The combinations are endless. Try a white chocolate/peppermint, a milk chocolate/dark chocolate, or a chocolate/toffee. Think about garnishes like sea salt, crushed nuts, or sprinkles. It helps to warm your knife just before cutting the bark for clean slices. 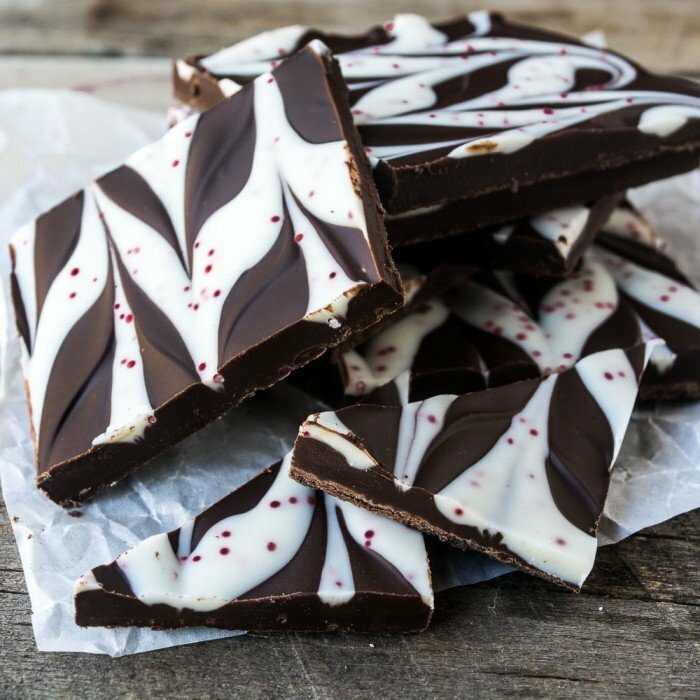 Chocolate bark should be kept chilled until ready to give or serve. If you are boxing it up, separate the layers of candy with waxed paper. The bark is almost prettier once it gets cut into squares, each one is like a unique little piece of delicious art. 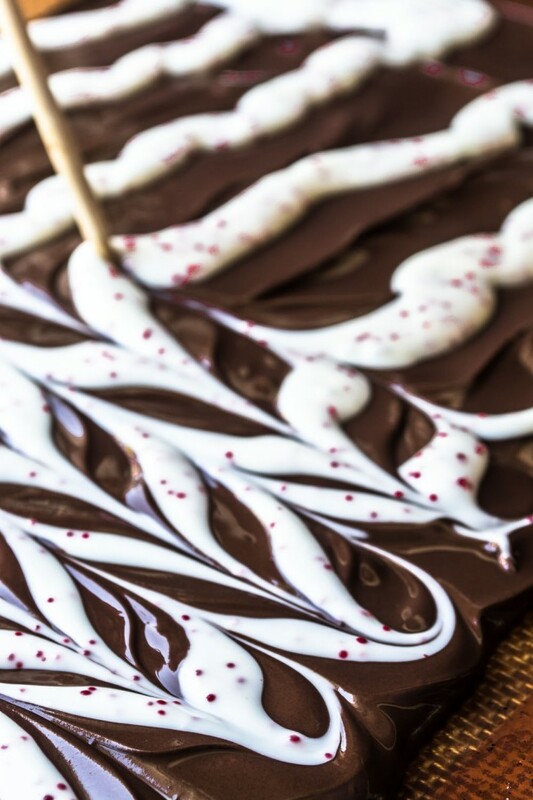 Do you (or does anyone) have any advice on how to drizzle the white chocolate evenly so it looks nice and clean like in the picture? Maybe what tools to use? This is so much easier than you might think, Kat. I just drizzled the chocolate right from the measuring cup that I melted the chocolate in. It doesn’t really matter what pattern you choose, once you go back through it with a chopstick type implement, it will look pretty, almost no matter how you to it. Made it for New Year’s Day. Did a double batch in a jelly roll pan (with shallow sides). I couldn’t find the thick Hershey peppermint bars so I used 2 of their thin ones. It wasn’t enough; couldn’t taste the peppermint. I learned that next time I’ll spread it out no wider than the length of my butcher knife. Even heated with hot water, it shattered the bark in the area where the knife didn’t reach. It sure was pretty and everyone loved it. My goodness, it’s so pretty, Sue! I love the scrolling swirls at the edge. Anyone would love this for a gift! 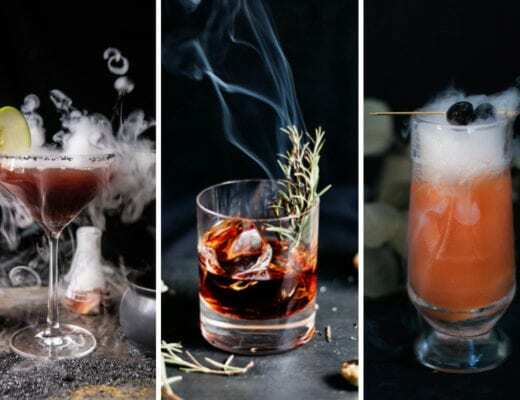 excellent tutorial and beautiful (and tasty!) end results! Wonderful looking barks, anyone would love that as a present. I love those swirls, what pretty bark for gifting! Totally gorgeous Sue! You’re absolutely right, PERFECT for gift giving! 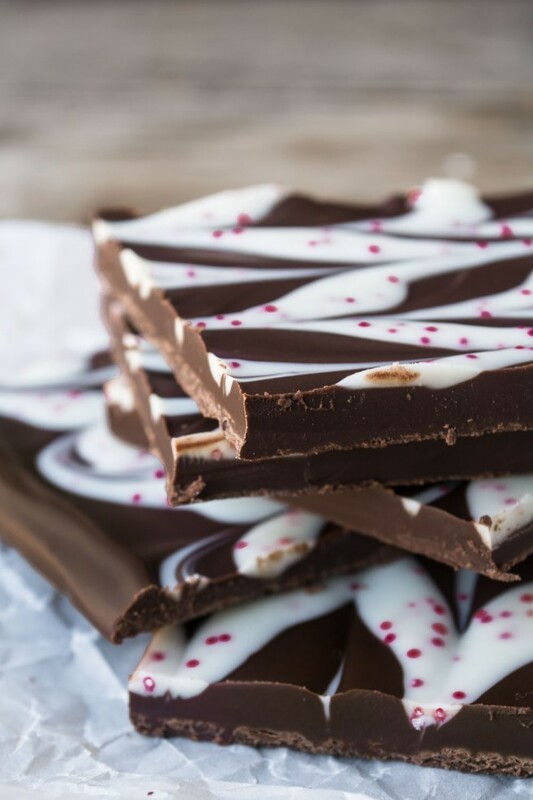 This is the prettiest chocolate bark I have ever seen! I have actually never made any kind of bark before, bu these both look so good that I want to try it ASAP. I predict you’ll become a bark addict, Meghan. You’re going to love it once you try, Meghan! The cleaning is the challenging part… when we were home, we used to keep making this and I used to eat most of it… looks delicious.. I fill the bowls immediately with hot water, that helps. So beautiful! I love those peanut butter bark, Sue. Sooo pretty and so many possibilities! I love this idea! I’m posting here in the hopes the post shows up. I’ve made the pistachio shortbread cookies several times now and they’re such a hit. I’m making some today to take to a party tonight. Thanks for the great recipe. 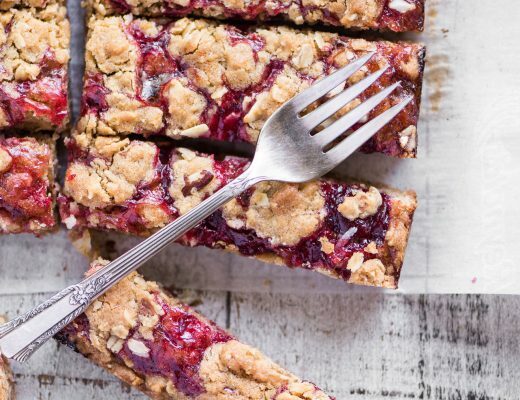 Thanks Susan — I love those cookies too, and they’re perfect for the holidays — sometimes I add dried cranberries to them, you might want to try that next time. Have a wonderful holiday week! I’m speechless. These barks are simply breathtaking! Sue you did an amazing job with this pattern. It’s challenging I know swirling just right. I’ve never tried peanut butter bark. Sounds tasty! I am drooling over this bark. 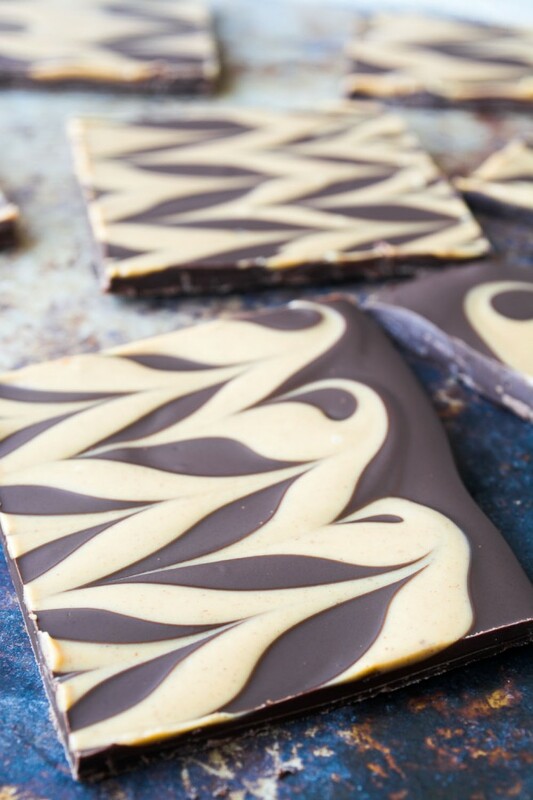 It looks gorgeous – the dark chocolate base with the candy cane bar just pops and the peanut butter one is just sure to be a hit! And there are so many different ways to go with the chocolate choices, too! 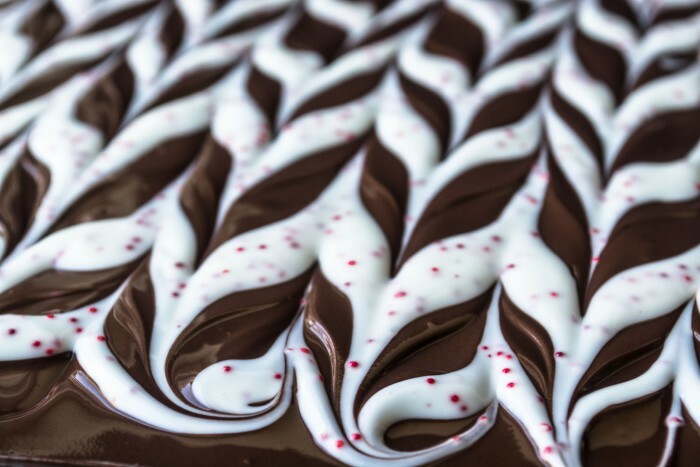 Beautiful swirls – they are like a work of art! That’s ok Julie, you can melt the chocolate on the stove top. You can simmer some water in a saucepan and then set a bowl over that to gently melt the chocolate.